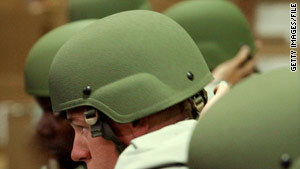 Advanced Combat Helmets failed to meet ballistics testing standards and were recently recalled. Washington (CNN) -- The company that made 44,000 helmets recalled by the Army has stopped all helmet manufacturing. Federal Prison Industries, the company that made the potentially defective combat helmets, was subcontracted to make the helmets by ArmorSource, the company named in the recall. Federal Prison Industries, also known as UNICOR, has also agreed to waive preferential status that gives it right of first refusal on U.S. government contracts. The Army recalled the helmets two weeks ago, when officials said the advanced combat helmets failed ballistic testing standards. Many were used by troops in Iraq and Afghanistan. Troops have been instructed to exchange the helmets for ones made by another company, but the Army is still trying to find all the recalled helmets. The company's decision comes after the Justice Department launched an investigation into its helmet manufacturing and an amendment was proposed to the Defense Authorization Bill. That amendment would have forced the company to submit to competitive bidding. The author of the amendment, Rep. Chris Carney, D-Pennsylvania, said, "Our military men and women deserve only the best equipment and it has become clear that Federal Prison Industries cannot meet the standards required in manufacturing helmets." The Federal Bureau of Prisons overseas Federal Prison Industries, which uses prisoners in some of its work. Traci Billingsley, the bureau's chief public information officer, said, "Federal Prison Industries has always strived to make a quality product that meets or exceeds the needs and expectations of our customers." She said if the company resumes helmet production, it will voluntarily submit to competitive bidding. The company is one of several major manufacturers of combat helmets. A competitor, BAE, laid off some of its staff earlier this year. Josh Drobnyk, a spokesman for Carney, said, "Absolutely there's a jobs element to it. I don't think it's widely known that prisoners are making the most basic part of a soldier's gear. And this company has quit making helmets right in the midst of an investigation by the Department of Justice." Army officials said the Justice investigation helped trigger the testing on the helmets that determined they did not meet standards. In addition to the 44,000-helmet contract, Federal Prison Industries had an Army contract to produce 600,000 helmets and a contract to deliver 100,000 lightweight helmets to the U.S. Marine Corps. Rep Carney said, "FPI has not met protective standards, nor has it met required deadlines in its production of these crucial helmets ... and we can't wait any longer to protect our troops." Carney is a U.S. Navy Reserve commander, who also served in the Pentagon as an intelligence analyst.